In a year dominated by elections, 2014 was marked by a series of "pushes" toward the future in Cannon County. Two of those pushes were in the form of elections in August and November. The November election offered no surprises in the officials picked for office, but was marked by an unexpected development in the narrow passage of a liquor by the drink referendum in Cannon County. The November ballot also included a non-binding vote on possible routes for the unfinished section of the expansion of state Route 70S. Passage of liquor by the drink in Cannon County could have a major side-effect by allowing the sale of beer on Sundays. As for the vote on possible routes through or around Woodbury with state Route 70S, a majority of voters cast their ballots in favor of by-passing Woodbury with a road that goes South of town. Some Woodbury businesses leaders fear that path could destroy the downtown shopping district. The Aug. 7 county election was marked by the breaking of a two-decade trend when Sheriff Darrell Young was re-elected to a second term. Political prognostications had predicted a close race between Young and challenger Brad Hall. Young ended up carrying all but one of the county precincts. County Executive Mike Gannon, bucking some statewide trends, was also returned to office. Changes in the County Commission membership also resulted in Gannon being returned as Commission chairman. That same contest ended Register of Deeds Debbie Morris' 28 years in office. Morris won her first election in 1986 and citizens kept her in the Register's office for almost three decades since. Morris successfully won six re-election campaigns. "I decided it would be my last time to run for office," said Morris of her 2010 bid for re-election. "It's not that I was tired of the job. I just wanted some me time. I consider myself fortunate because I have loved the job, and I love the people of Cannon County." 2014 also witnessed the possible completion of the state Route 70S project. The word "possible" refers to the fact that a four-lane path either through or around Woodbury remains unresolved. Funds for the project are currently depleted, leaving seven miles of the roadway as a two-lane. 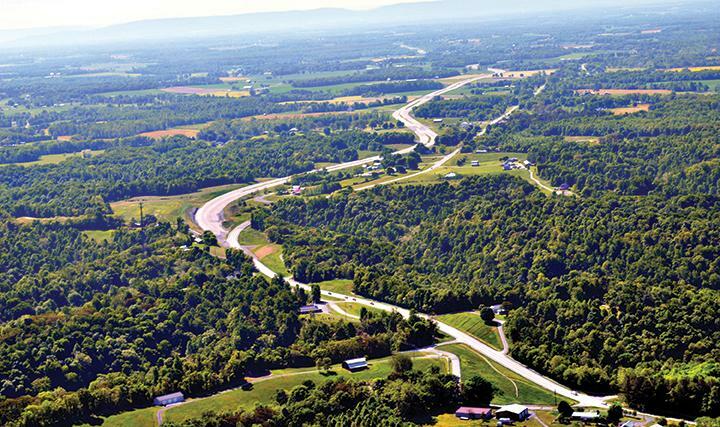 Completion of the Warren to Cannon County portion of the highway was delayed for months due to unforeseen issues including weather and a gas line. Trouble with a gas line is among the issues that pushed back completion of the new four-lane version of U.S. 70S between Woodbury and McMinnville. The highway project was supposed to be completed by the end of September, but contractors were delayed until late November. Work on the project began in 2006. Cannon County officials did push ahead on plans to construct a new Emergency Medical Service center. The location, adjacent to Stones River Hospital, did cause some controversy amongst members of the Cannon County Commission. However, the project was approved and is now under construction. Officials broke ground for the center July 8 after the low bid for the project was approved during a County Commission meeting the previous week. Though Commissioners unanimously approved Brindley & Sons Construction, Inc. of Tullahoma's low bid of $479,250, they also voiced their concern regarding the Emergency Medical Service Station's location. "I have no problem with the bid but there has to be a better place in this town for an ambulance center," then Commissioner Jim Jones said. "I'm only asking you approve the low bidder," Gannon said. "This particular agenda item has nothing to do with location, just approving the low bid." 6. The year was marked with good news for wounded soldier Franz Walkup. Walkup, seriously wounded in Afghanistan, reached out via crowd-funding to earn money for a handicapped accessible home in Woodbury. Walkup has undergone 78 surgeries and countless hours of rehab at Walter Reed Hospital in Washington, D.C. after being shot five times by coalition Afghan soldiers during a patrol through the Taliban-controlled Tangi Valley on Sept. 29, 2012. When Franz and his wife Shannon applied for financial help to build a handicapped accessible home, the couple was rejected by at least five organizations. "They act like getting shot five times wasn't enough. Because he didn't step on an IED. You didn't lose extremities," said Shannon Walkup. The news media is beginning to share Walkup's story, which was initially broadcast by WUSA in Washington, D.C.
"It's hard because it kind of feels like my sacrifice wasn't great enough," Walkup told WUSA. Since then, other major media outlets like the New York Daily News and The Huffington Post have picked up Walkup's cause. Walkup, a sergeant in the U.S. Army's 2nd Battalion, 503rd Infantry Regiment suffered a shattered right pelvis, damage to the spleen and large intestine and lost function in his right leg below the knee after being shot in the stomach, back and leg. Tireless rehab allowed Walkup to walk using one crutch by March. He picked up hand cycling not long after. But the soldier is still handicapped. The couple, who now live in Gaithersburg, Md., hopes to relocate to a house with doors wide enough for a wheelchair in Woodbury. Franz has still got both of his legs, but one of them doesn't work. "I fit into that gray area where I have the loss of the limb, but I still have my limb," he explained. His body is a roadmap of his injuries. A shattered pelvis, a broken leg. He lost his spleen and most of his small and large intestines. "It's not just me that served and sacrificed," said Franz, proud to come from a military family - one of four brothers to serve. His older brother, Frank, was killed in Iraq by a roadside bomb in 2007, three days before his 24th birthday. The Walkups received a big surprise from Ellen DeGeneres in Dec on her TV talk show, "Ellen." Ellen presented the young couple with a plant for their new home being planned near Woodbury. Inside the oversized planter was $15,000 from Shutterfly to be used for their home in Woodbury. Franz had a surprise for Ellen in return. He presented her with his Purple Heart Medal. 7. It was a good news year for Cannon County High School's Beta Club as well. We already knew Cannon County's Senior Beta was the most talented in the state of Tennessee. That much was established when the ultra talented group won the competition for group talent at the State Convention in Nashville last November. They proved to be the best America when performing on the national stage too. Cannon County's Senior Beta Club finished first in the nation for group talent during the Senior Beta National Convention in Richmond, Va.
"It was an awesome experience," said Jeffery Northcutt, one of 13 seniors who gave up much of their summer to continuing to practice for the National Convention. "We performed well. We had a great routine and felt we had a chance to win, but it's a great feeling to hear your name called." Jeffrey now calls UT-Knoxville home were he's better known as "Smokey," the official mascot. Thanks Mike: A job well-done, took a long time and well-researched ... you da man! !